Stone Mountain is in Metro Atlanta. The town is named for Stone Mountain, the largest exposed granite dome in North America, featuring the largest bas-relief sculpture in the world, of Confederate Civil War heroes Jefferson Davis, Robert E. Lee, and Thomas "Stonewall" Jackson. The town was incorporated in 1839 and has a population of approximately 7,000 people. The Stone Mountain Industrial Park is a large employer in the area. Stone Mountain retains its small town feel despite being so close to one of the biggest cities in the Southern United States. There is a concerted effort to revitalize and grow the downtown area, tapping into the legions of tourists at the nearby Stone Mountain Park. Stone Mountain, the city, is due East of Atlanta on Stone Mountain Parkway, which is just north of Interstate 20. MARTA buses and trains run to the Stone Mountain area; it's also possible to ride your bike from downtown Atlanta to Stone Mountain Village on the bike trail. Public transport is very little or nothing due to its small size. Stone Mountain Park, . approximately 15 miles east of downtown Atlanta. Stone Mountain village has some interesting craft style shops, but the main attraction is the mountain itself. Please don't be put off by the tacky nature of some of the 'attractions' in the surrounding park; the park itself is an attractively wooded area and the summit of the mountain is just about the most stunning view in the Atlanta area. Stone Mountain is the largest exposed piece of granite in the world. It was created when shifts in the earth's crust created extreme heat and friction and melted a large amount of rock below the surface. This heated magma bubbled up towards earth's surface but did not make it all the way. Over time, the magma hardened into granite. Eventually, the land on top of the granite dome washed away through erosion and left what is now Stone Mountain. The top of the mountain is a surreal landscape some 800 feet above the surrounding land, and provides excellent views of the surrounding area and the skyline of downtown Atlanta. The summit can be reached by the attractive but steep walk-up trail through woodland (which leaves from near the Confederate Hall and park entrance) or by the Sky Lift (see below). Please exercise some care when on the summit; the horizontal bare rock of the top curves imperceptibly until it becomes the vertical bare rock of the sides and it is important not to wander too far around that curve. Lasershow Spectacular, . The park's signature event is a stunning display of light and color, projected onto the main face of the mountain after dark. The show is free with your entrance to the park, but be sure to grab your seat on the lawn before they're all gone. Leila Mason Park - Located in the Historic Shermantown neighborhood next to Stone Mountain Park. It has a baseball field, basketball court, playground equipment and a covered pavilion with picnic tables. McCurdy Park - Home of the Stone Mountain Youth Athletic Association baseball program. Three little league fields and four covered picnic areas area available along with a large playground dubbed "Jim's Place." Located off West Mountain Street, across from the Post Office. Medlock Park - Home field for the Ray of Hope Jaguars Little League Football Teams. There is a regular football field, complete with concession stand as well as four tennis courts, a picnic pavilion and an outdoor basketball court. The entrance to the park is off of Ridge Avenue. VFW Fields - Three little league baseball fields are just off of Gordon Street behind the Post Office. 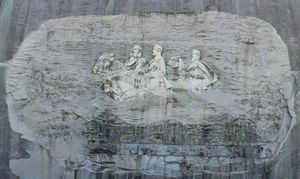 Skyride, a Swiss built cable-car to the summit, passing over a carving of Confederate heroes on the sheer wall of the mountain, created by Gutzon Borglum, who also sculpted the Lincoln Memorial in Washington and the four Presidents on Mt. Rushmore. Operates from 10am-5pm (later in summer). Historic Walk-Up Trail, a 1.3 mile walking trail to the top of Stone Mountain. Starting behind The War in Georgia building, the path is easy at first, but becomes steep at the top. Most people should be able to complete the walk. Along the way you will pass inscriptions in the rock made by locals before the park was established. At the top you will be rewarded with some of the finest views in the Atlanta area! Unfortunately, pets are not permitted on the trail. Scenic Railroad, a railroad which circles the entire circumference of the mountain in a one way loop, giving views of the mountain en-route. There are two stations, the main depot and a stop near the Confederate Hall/Walk up trail/Park entrance. Passengers boarding at the main depot must have a ticket or pass; however, passengers are allowed to use the train for free from the Confederate Hall stop back to the depot where all passengers must disembark. Operates from 10:50AM-5PM (later in summer). Riverboat, a scenic cruise aboard a reproduction Mississippi riverboat on 363-acre Stone Mountain Lake. Operates from noon-5pm (later in summer). Antebellum Plantation & Farmyard is comprised of original buildings, built between 1790 and 1845, which represent an authentic, pre-Civil War Georgia plantation. Open from 10AM-5PM (later in summer). Carillon. The 732-bell Carillon originates from 1964 World's Fair in New York City, and provides a daily concert. Confederate Hall, a museum that educates park guests and local students on the fascinating geology and ecology of Stone Mountain, together with the history of the war in Georgia. This museum is operated directly by the non-profit foundation which owns the mountain, rather than the franchisee responsible for everything else. Open M-F 9AM-6PM; Sat 10AM-6PM; Sun noon-6PM. Free. Stone Mountain Park is best accessed by car, there is an $10 per car one-day parking permit charge (or $35 annual parking permit) in addition to the attraction charges. There is no admission charge for those entering the park on foot; catch the MARTA rail system to Avondale and transfer there to MARTA bus route 120; disembark at the intersection of Ponce De Leon Avenue E and J.B.Rivers Memorial Drive and the park entrance is some 15 minutes walk east down J.B.Rivers Memorial Drive past the fire station. Stone Mountain Village . Located just outside the West Gate of Stone Mountain Park, you can easily enjoy over fifty specialty shops and restaurants that offer something for everyone. Find antiques, collectibles, fine art, jewelry, and a number of specialty shops, including The Cranky Princess located in a 100 year old bungalow style house at the beginning of Main Street. 988 Main St, +1 770 879-3553. Bundos Market Restaurant, +1 678 476-6632. Italian cuisine, open 7 days. Magnolia Restaurant and Tea Room, +1 770 498-6304. Located in an Antebellum Victorian home dating back to 1854 and serving classic southern cuisine. Open Th-Sat 11AM-2:30PM and Sun brunch from 11AM-2:30PM. Mama Mia's Pasta and Pizza, +1 770 469-1199. P.D. 's Grill and Cafe, +1 770 465-0522. Burgers, sandwiches, and more. The Sycamore Grill, +1 770 465-6789. A full service restaurant serving Southern cuisine. Wells Cargo Cafe, +1 770 469-0400. Soups, salads, sandwiches and entrees featuring seafood, steak and chicken. Motor City Coney Island ([email protected]), 1825 Rockbridge Road (Hwy. 78 and E. Park Place Blvd), . Coney Hot Dogs, Breakfast, Corned Beef, -- A Coney Dog Make Any day Better. Low priced. Summits Wayside Tavern, 3334 Stone Mtn. Hwy., +1 770 736-1333, . By far the best bar in the Stone Mountain region. Over 100 different beers on tap and several hundred different bottled beers as well from all around the world. Be sure to go on a Saturday night, because it is "Pint Night". You drink the pint of the night and keep the glass. Worth the visit even if you don't drink as their food is incredible. Weeyums, 900 Main Street, Stone Mountain, GA 30083, ☎ 770-322-0000. Open Monday - Saturday, closed Sunday. Philly Cheese Steaks. Hampton Inn, 1737 Mountain Industrial Blvd, +1 770 934-0004 or +1 800 HAMPTON, . Located three miles from Stone Mountain Park. Part of the Hilton Family of hotels. Offers both regular rooms and mini-suites. Rates vary between $90-$130. Silver Hill Manor Bed and Breakfast], 1037 Main St, +1 888 381-5808 or +1 770 879-6800, . Housed in a stately, reproduction antebellum mansion, Silver Hill offers six rooms, three featuring an in-room jacuzzi. Rates from $140 - $200 per night. The Village Inn Bed and Breakfast], 992 Ridge Ave, +1 800 214-8385 or +1 770 469-3459, . Built in the 1820s, the Village Inn offers six guestrooms, all with whirlpool tubs and include a full Southern Breakfast. Enjoy their fireplaces on a cold winter night or sit out on the veranda to enjoy a warm summer day. Rates from $129-$169 per night. Evergreen Marriott Conference Resort, 4021 Lakeview Drive, Stone Mountain, Georgia 30083 USA, ☎ 1-770-879-9900, . Situated only 16 miles from downtown Atlanta, the resort is surrounded by 3,200 ares of natural wooded beauty with lush forests and sparkling lakes. This page was last edited on 12 July 2017, at 13:03.